"I am an Industrial Designer based in Sydney. During the course of my work I am exposed to many and varied design briefs, manufacturing processes, materials, consumer information and insights, brands and visions of the future. First and foremost in any designers mind must be innovation and change. Not just for the sake of it but with the open intention to "Surprise and Delight" the end user. One particularly project we worked on involved synthetic grass (as project which never came to fruition). Talk in the design office inevitably went to the extreme thought... why don't we carpet the office in this stuff! I was all for this, being the type of person who removes his shoes as soon as he sits down at his desk. The idea grew and I thought "what if I could walk barefoot on grass anywhere, anytime". Who doesn't like that? I made a single pair of grass flip flops. Just for myself at first. I wore them to work and the reaction there and on public transport was stunning. It took a few months of wearing them to decide that I had an idea worth marketing. Another six months of design and development, sourcing the right type of grass, patents, manufacturing research, samples after samples and they were finally ready for market. 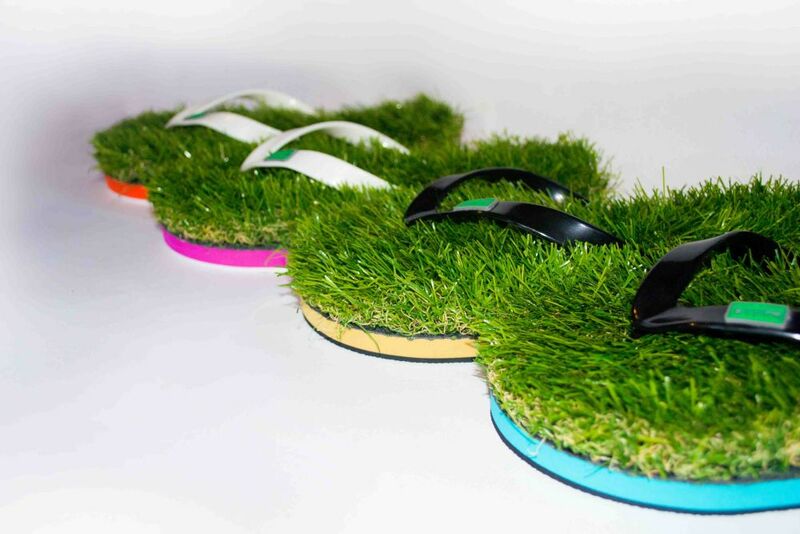 KUSA Grass Flip Flops were released in the first week of January 2012. I sent images to 2 blogs. 1 ran with the images. The rest, as they say..."
At £17.99 these flip flops are perfect as a gift or as a treat for yourself. You can choose from a selection of four different colours (Blue, Mustard, Orange and Pink), and from three different sizes (Small (2-5), Medium (5-9) and Large (9-12)), so you are sure to find a pair that's just right. Best to check out their size chart to make sure your pair are the right fit for you! Don't panic if they feel too tight for your feet at first - after a bit of toe-wriggling your KUSA's will conform to your feet. One last reminder: Do not mow - the grass won't grow back!